The Craig Daily PressCraig Daily Press is seeking photos of hunting adventures and story suggestions from area hunters for inclusion in its annual “Colorado Hunter” publication. is seeking photos of hunting adventures and story suggestions from area hunters for inclusion in its annual “Colorado Hunter” publication. Craig Daily Press is seeking photos of hunting adventures and story suggestions from area hunters for inclusion in its annual “Colorado Hunter” publication. Story ideas range from features about generations of hunters to new equipment that is changing the world of hunting, and anything in between. Photos need to be at least 300 dpi and clear for publication. The Daily Press would need digital .jpg files. Call Editor Joshua RobertsEditor Joshua Roberts at 875-1791 or email him at jroberts@craigdailypress.com, or at 875-1791 or email him at jroberts@craigdailypress.com, or sports reporter Joshua Gordonsports reporter Joshua Gordon at 875-1795 or e-mail at joshgordon@craigdailypress.com with suggestions or questions. at 875-1795 or e-mail at joshgordon@craigdailypress.com with suggestions or questions. Editor Joshua Roberts at 875-1791 or email him at jroberts@craigdailypress.com, or sports reporter Joshua Gordon at 875-1795 or e-mail at joshgordon@craigdailypress.com with suggestions or questions. 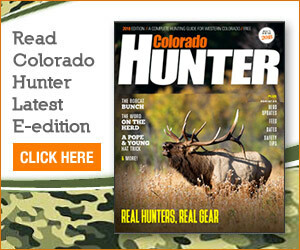 To see last year’s “Colorado Hunter,” visit www.craigdailypress.com/coloradohunterwww.craigdailypress.com/coloradohunter..www.craigdailypress.com/coloradohunter.